Iʼve been working with reclaimed items for the last few years, and over that time my favorite part of my job has remained the same – the fact that every one of the items in the shop has a story. And fortunately for me, because I run the joint, Iʼm almost always behind the scenes to find out exactly what that story is. Whether the piece is taken to the shop or it comes home with me (this seems to happen a lot), thereʼs always a history there. Where I got it, who I bought it from, what it was doing before I gave it a new purpose, how I got it up my stairs (more about the stairs later). So, without further ado, here are a couple of my very favorite stories from some of my very favorite pieces. My boar barrier – I know what youʼre thinking, “Whatʼs a boar barrier?” Occasionally, I go back to my familyʼs farm in central Illinois to visit and just escape life for a couple days. When I do, I often coerce my uncle into going through the old barn with me while I search for treasures. Secretly, I think he likes to see what I define as “treasure” though thereʼs a lot of sighing and head shaking on his part during our excursions. So, a few years ago weʼre trudging through the barn and I see a little sliver of wood tucked behind a beam by the door, and for some reason, I just had to find out what it was. So my uncle heaves it out and voila, a totally amazing family heirloom hidden for over 50 years in the depths of the old barn! Ok, so Uncle Jim did NOT think it was an heirloom, but I was pretty pumped. Apparently my dad and one of my uncles used to show chester hogs at the fair in town and they needed a barrier between them to keep the hogs from fighting, so they built this totally amazing wooden gate and used old stickers from the hardware store to emblazon their names on it! Turns out (and this is my favorite part) the gate was totally ineffective as the hogs could see right through the openings of the gate to the other side causing them to fight and squeal and make a complete scene. The boar barrier now hangs proudly in my bedroom, because, where else would one hang a boar barrier? I love knowing that it was used on the farm, built by my dad and his brother, that I rescued something hidden for over 50 years, and letʼs face it, itʼs always great when the adjoining story makes fun of your family members. 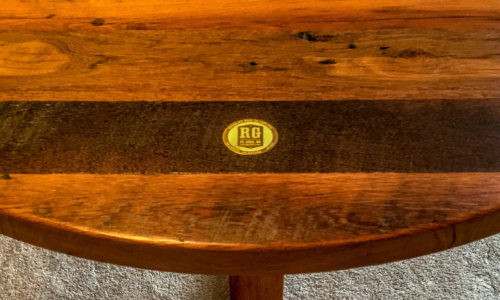 Next, my coffee table – Yes, Iʼm a little biased and they were the ones who asked me to do this guest blog thingy, but my second favorite thing in my whole apartment is my brand spanking new coffee table made by the guys at RG. 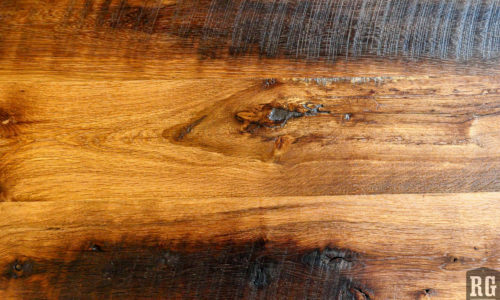 Itʼs a combination of everything I love – reclaimed barnwood, patinaed metal, and wheels. In short, itʼs killer. So, here is the story behind my coffee table. After finding a matching set of 4 huge, metal casters with legs while on the hunt for Found, I knew first, they had to be mine, and second, Iʼd be taking them right to the guys at RG when I got home. I had this great design idea for a coffee table with two simple reclaimed barnwood shelves on the amazing caster wheels. This dream tanked pretty quickly when I found out the legs, as found, werenʼt going to be able to work with two shelves. Wanting to maintain the integrity of the casters as I found them, here came design change #1: one shelf, but letʼs do it with those killer scaffolding wheel legs sticking straight through the top of the table! Totally cool and edgy, right? Wrong. Luckily the guys knew me and my taste well enough by this point to text me a pic of my newly adapted table. I replied back “It looks weird,” and Iʼm pretty sure Tim just said, “Yep.” So, design change #2: get rid of the huge metal rods sticking through the top of my table that I was bound to impale myself on eventually. Much better, but how to cover the four holes left behind? Sidebar: I love metal plumbing pipe and have been known to repurpose it around my place many times over. So, design change #3: cut down the leftover metal from the scary, impalement caster legs, counter sink some cool metal plumbing caps on the top, and boom! Until I woke up in the middle of the night that night second guessing my design – ok, fourth guessing, but you know what I mean. A long, ridiculous e-mail to Lance at 1 in the morning telling him to stop work on the table because I just didnʼt like what I had turned my table into since Iʼd started making changes may or may not have happened. Also, I made him promise to tell Brian because I didnʼt want him to hate me and take it out on my coffee table. Another sidebar: This is what happens when you spend your whole life designing for other people – all the good ideas stay far, far away from your apartment. So, the reply? “No haters over here. We want you to get the table exactly how you want it.” Total lies, but it made me feel better at the time. So I planned out a day to just go into the shop and stare at my table. Seriously! I needed to look at what it had become and where it needed to go. I laid on their floor and sketched. Then I poured through the junk pile in the back of Rustic Grain and what did I find? Angle iron – one of my most favorite things in the whole world! Even better? It was old, rusty, beautiful, patinaed angle iron. (You canʼt just buy this stuff at Home Depot, you know!) It was perfect and at that moment, I knew exactly what my coffee table was going to look like. I brought it out, laid it on my table top and waved Brian down, because yelling is not a useful tool in that workshop – those saws get crazy loud, people. At this point, I may have even said “tada” with design change #4: the angle iron needed to be stripped of bolts, reformed, attached to the existing table top, and then the table needed to be carried up my 17 steps (ask Lance and Jimmy about my steps – they loooove my steps.) So, maybe not so “ta-da” after all. The guys were wonderful – all of them. They nurtured my fractured design ego and made sure I ended up with exactly what I wanted. So, fast forward a few weeks and my coffee table is, in a word, perfect. The look fits with the rest of my place, the craftsmanship is stellar, and the design, if I do say so myself, is pretty dang cool. So there are a few of my favorite stories and I hope you have more than a few of your own. The history behind reclaimed, repurposed items like these are always funny and cool and interesting and ridiculous. 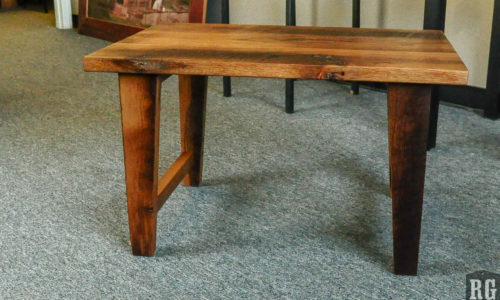 Itʼs what makes the world of reclaiming and upcycling so amazing – everything has a story. These pieces donʼt come in a box or from a chain store and you probably wonʼt find another one like it. Theyʼre rough around the edges and absolutely imperfect, just like us. And let me tell you, itʼs a whole lot more fun to think outside the box. Maybe thatʼs why I like these RG guys so much – theyʼre living outside the box with me. And if nothing else, hey, at least I have a great story when people ask me where I got my coffee table, right?